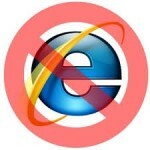 Do you click on a blue ‘e’ to surf the web? If so, now is the time to move on to another browser for many reasons. The most critical is the security of your PC (and your business). Microsoft’s Internet Explorer comes with Windows so most individuals and businesses use it as their way to access the Internet. The problem is that it’s riddled with security holes, prone to poor performance, and the latest versions are incompatible with some websites. With the advent of new web technologies such as HTML 5 and much better alternatives there is no reason anyone should be using Internet Explorer any more. Did I mention it’s a huge security risk? A month ago a new exploit was released into the wild that takes advantage of yet another security bug in Internet Explorer. Microsoft will not have an automatic fix for this until Oct 8th. This new bug is being used right now to install malware on computers around the world. While no browser is 100% secure, most of the other ones would act more quickly to fix such a serious issue. Also, most bad guys will write exploits for Internet Explorer as it is the most popular browser in most places. The good news is that there are many other browsers to choose from. Most Mac users use Safari. Other popular ones are Google Chrome and Firefox. Our recommendation is Google Chrome. It is fast and reliable. It also offers many features not found in Internet Explorer such as syncing of bookmarks and history across all your devices. This makes it the perfect choice if you have an Android based phone or tablet. It also has many free apps that connect your data between devices and makes life a lot easier. Two of our favorites are Chrome to Phone and Google Keep. I run a business. What can I do at work? If your in charge of managing multiple computers at work going to each one to install Chrome can be a chore. Luckily many free tools exist which can remove the Internet Explorer icon from the desktop and remotely install your new browser of choice. If you would like more information on these tools please contact us via email or phone. Was My Facebook Info Hacked?